Radeon Settings doesn't affect anything in CRU. Did you do anything in CRU? Running reset-all.exe and rebooting will reset anything done with CRU. Is this a 1600x900 monitor or 1680x1050 monitor? 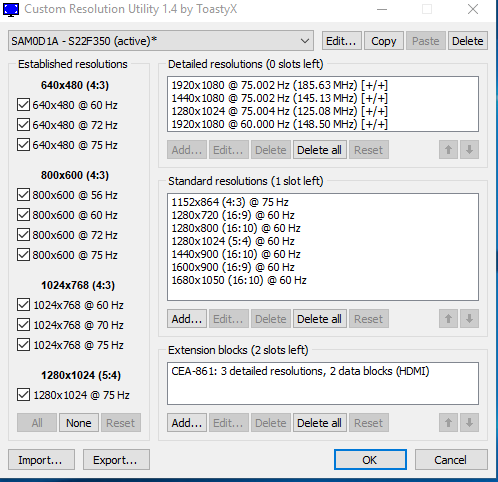 Are you able to delete the custom resolution from Radeon Settings? If you can't get it back to normal, use DDU to completely uninstall AMD's driver: https://www.wagnardsoft.com/display-driv...aller-ddu- That will remove all settings and also anything done with CRU. There should be nothing left after that. Then reinstall AMD's driver. I have a 1600*900 monitor, I use HDMI to VGA adapter (VGA monitor). I created a custom resolution via Amd radeon in the Display tab. The only thing that changed is the frequency to 75 Hz. After I got 1680*1050 and 59 Hertz. I tried my best to get the old one back, but the monitor image was distorted, as if set to an inaccessible resolution. I 5 times reinstalled the video card driver via DDU, after that, too, did not help. After that, the PC returned to its previous state through such a function in the Windows 10 settings. After the Wipe of all applications (excluding application data), the resolution of 1600*900 was not restored again, and it is by default. Installed AMD driver all the same. Tried through other adapters (DVI-I VGA) resolution is not put on stock. What am I to do? (02-11-2019 06:07 PM)Nekti Wrote: I have a 1600*900 monitor, I use HDMI to VGA adapter (VGA monitor). I created a custom resolution via Amd radeon in the Display tab. The only thing that changed is the frequency to 75 Hz. After I got 1680*1050 and 59 Hertz. I tried my best to get the old one back, but the monitor image was distorted, as if set to an inaccessible resolution. I 5 times reinstalled the video card driver via DDU, after that, too, did not help. After that, the PC returned to its previous state through such a function in the Windows 10 settings. After the Wipe of all applications (excluding application data), the resolution of 1600*900 was not restored again, and it is by default. Installed AMD driver all the same. Tried through other adapters (DVI-I VGA) resolution is not put on stock. What am I to do? If DDU didn't work, then it sounds like something is wrong with the monitor. What resolution does CRU list as the first detailed resolution? If nothing, is the monitor listed as Generic Non-PnP Monitor? That would indicate the monitor is not sending an EDID. If that's the case, try unplugging the monitor's power for a minute and see if that resets it. The R9 270X does not have HDMI 2.0, but it might be possible to get 60 Hz with YCbCr 4:2:0. Does the extension block have a "4:2:0 resolutions" or "4:2:0 capability map" data block? If not, add a "TV resolutions" data block, check "4:2:0 resolutions", and add 3840x2160 @ 60 Hz. I've used CRU for the past few weeks now and I've noticed that ever since I've used CRU, games that would previously run in Full Screen would no longer work - in terms that most games now basically only run in Fullscreen-Borderless. Any help? (02-14-2019 02:18 AM)Whomity Wrote: I've used CRU for the past few weeks now and I've noticed that ever since I've used CRU, games that would previously run in Full Screen would no longer work - in terms that most games now basically only run in Fullscreen-Borderless. Any help? I can't think of any reason that would happen. The only thing that comes to mind is maybe the game is trying to set a resolution/refresh rate that no longer exists, but most games would just choose a default resolution/refresh rate. What changes did you make with CRU? here is what my CRU looks like. I believe I only added 3 Detailed Resolutions @ 75hz. I can successfully overclock my laptops screen 60Hz to 100Hz but for some reason my "bit-depth" goes to 6-bit from 8-bit. And it looks really bad. Is there anyway to fix this? If you guys need anything like my CRU settings, laptop model brand etc... let me know please. (02-18-2019 07:43 PM)BlackShadowX Wrote: I can successfully overclock my laptops screen 60Hz to 100Hz but for some reason my "bit-depth" goes to 6-bit from 8-bit. And it looks really bad. Is there anyway to fix this? If you guys need anything like my CRU settings, laptop model brand etc... let me know please. Sounds like a bandwidth limitation. If the laptop panel has a 2-lane eDP interface, it would be limited to 180 MHz pixel clock at 8-bit color and 240 MHz pixel clock at 6-bit color.